Join the discussion on our forums! 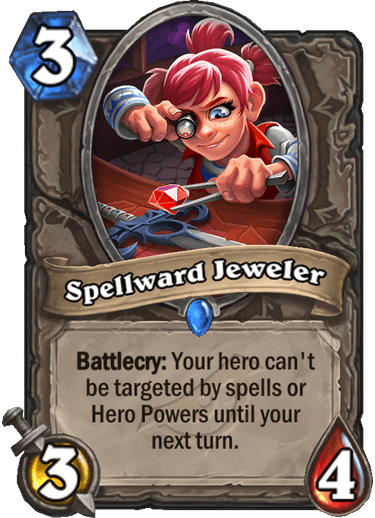 Come discuss Spellward Jeweler over in our dedicated Spellward Jeweler discussion topic. Battlecry: Your hero can't be targeted by spells or hero powers until your next turn. The fanciest possible way of distracting enemies with shiny things. It’s not Kobold Monk. You can just kill the Monk and effect disappears. This card makes the same with Battlecry, meaning your hero will not be targeted until your next turn no matter what. This card counter some Malygos decks, like old Malygos Druid or Malygos Rogue and various Burn/Face/Aluneth Mages.